The history of UC Merced dates back to 1988, when the UC Regents first authorized planning for at least one additional campus based on projections of long-range enrollment demand. From an initial review of more than 80 sites in the San Joaquin Valley, 20 were initially advanced for additional study. Eight sites were further evaluated and visited by a senior-level task force, leading to the identification of three sites that were selected for detailed analysis and for inclusion in a full environmental impact report. Following this careful process, the UC Board of Regents selected a site in eastern Merced County adjacent to Lake Yosemite Park as the location for the 10th campus of the University of California in May 1995. The land was to be donated by the Virginia Smith Trust, a charitable trust that provides college scholarships to Merced-area high school students. Adequate water would be available for university needs. The county government initiated a planning process to assure compatible development of adjacent land and good transportation access. Merced is centrally located with easy access from communities in the San Joaquin Valley, including the Valley's largest city, Fresno. By 1997, UC Merced had established a regional office at Merced College, and the UC Fresno Center also served as a focal point for the new UC Merced campus. In 1998, the university joined with the Merced County Board of Supervisors, the Virginia and Cyril Smith trusts, the City of Merced, and the Merced Irrigation District to initiate a collaborative planning process for the university community. The planning process produced a concept for a campus and community that could grow together in harmony with the landscape. 26,000 acres of seasonal wetlands adjacent to the campus are now permanently preserved by the state. That same year, Carol Tomlinson-Keasey was appointed senior associate to UC President Atkinson to lead planning and development of the UC Merced campus. In 1999, Tomlinson-Keasey was appointed as founding chancellor of UC Merced, and the Tri-College Center on the campus of Merced College began to present UC Extension courses offered by UCs Riverside, Davis and Berkeley. 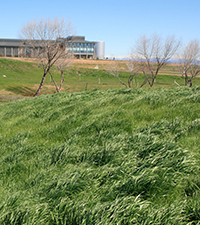 As the planning process for the campus and its academic programs continued into 2001, much progress was made, including the establishment of a new UC Merced Center in Bakersfield. UC Merced now has four locations spanning the San Joaquin Valley and Southern Sierra Nevada region. Careful analysis of the site's environmental aspects contributed to a decision to move the campus and community closer to existing urban areas and away from more environmentally sensitive lands. The concepts developed jointly by the community and the university formed the basis for the preparation of the campus Long Range Development Plan (LRDP) and the county's draft University Community Plan. 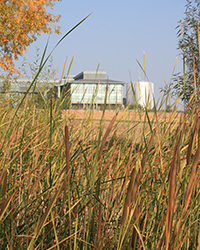 The Board of Regents approved the UC Merced LRDP and certified the associated Environmental Impact Report (EIR) in January 2002. Merced County approved the University Community Plan in December 2004 and certified the associated EIR. This action was a key milestone for the eventual development of the university community. Faculty members began to arrive in 2003 with graduate students in tow and began setting up research laboratories and programs at UC Merced's ancillary research facility on the former Castle Air Force Base, biding their time until buildings were ready on campus. The first graduate courses began in fall 2004. The campus celebrated its official grand opening and the arrival of the first class of undergraduate students on Sept. 5, 2005. The first semester saw most activities on campus taking place in the Valley Terrace housing complex and the Leo & Dottie Kolligian Library, as other campus buildings were not yet ready for use. The Classroom and Office Building and the Science and Engineering Building opened for use in January 2006. UC Merced has enjoyed strong bipartisan support throughout its history. Conceived under Gov. George Deukmejian in 1988, the campus was sited under Gov. Pete Wilson in 1995. Groundbreaking took place in 2002 under Gov. Gray Davis. The campus opened in 2005 under Gov. Arnold Schwarzenegger and embarks on its ambitious 2020 Project under Gov. Jerry Brown. To date, the state has invested more than $500 million in construction and development of the 2,000-acre site. Upon completion of the 2020 Project, UC Merced will be able to accommodate up to 10,000 students, and as many as 25,000 students when the campus grows to full capacity in about three decades. Carol Tomlinson-Keasey left the university in 2006, subsequently retiring from the University of California. In her place, Sung-Mo "Steve" Kang, UC Santa Cruz's school of engineering dean, was appointed chancellor in March 2007. Kang was formally inaugurated in September 2007 and led the campus until June 30, 2011. As chancellor, Kang oversaw increases in student enrollment and also the physical expansion of the campus. Kang returned to the faculty to focus on his research. Tomlinson-Keasey's death from a longtime illness in September 2009 saddened the university community, but the legacy she's left behind at UC Merced will speak of her commitment to both the UC system and Central Valley forevermore. In May 2011, the UC Board of Regents appointed Georgia College & State University President Dorothy Leland to serve as the campus's third chancellor. Upon her arrival in July 2011, Chancellor Leland immediately began to seek out solutions to expand and strengthen the campus’s physical, financial and academic position – even in the face of serious challenges caused by the global economic recession. Through her strong leadership and passion for the campus’s mission, UC Merced embarked on an unprecedented $1.3 billion capital expansion. The Merced 2020 Project received formal approval from the UC Board of Regents in July 2016, broke ground in October 2016 and will double the campus’s physical size by fall 2020. The legacy of this work allows UC Merced to be well positioned to expand access to California’s most talented students and to continue its rise to higher levels of research excellence.